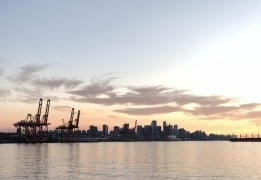 A judge in Canada has ruled a 2105 bunker spill in Vancouver was the result of a manufacturing defect and not negligence by the the owner or crew. The 2,700 litre spill from m/v Marathassa gained signifiant media attention after HFO washed up along the shores of popular tourist sites and multi-million dollar homes, resulting in 10 charges being laid and the Canadian Coast Guard forced to defend the oil spill response efforts as "exceptional" after the Mayor of Vancouver said they were "totally inadequate". But on Tuesday Judge Kathryn Denhoff dismissed the last charges faced by the vessel and its owners, ruling the spill was caused by a faulty valve and the owners and crew had done everything reasonably possible including implementing their oil spill response plan. Further, an alarm designed to alert the crew to such an incident was not properly installed. The Japanese-built vessel was on its maiden voyage when the incident occurred, having been commissioned just three weeks earlier. Eugene Kung, a staff lawyer with West Coast Environmental Law, said the result highlighted failures of the current legal system to protect the environment. "It’s extremely disappointing because I think it really highlights that there are some massive tanker-size gaps in our laws and spill response," Kung was quoted by local media as saying. At the time of the spill, local media suggested the entire cost of the cleanup operation would be paid for by the shipowner. One analyst thinks WTI could reach $70 at this rate. World's biggest bunker sales port posts another now typical 4 million mt sales month. 200,000 bpd refinery comes via Indian-Omani investment.